The textures of the environment were done in Houdini with a custom procedural approach and baking tool. The layout and geometries of this world changed a lot during the project so with this approach I was able to develop the look of the textures really early in the project. After that I just had to reload the new alembic and everything was following with our object naming conventions. The shading was then done with Redshift for Maya. We also created some Python scripts during the production for quick material assignment and development (thanks a lot to Jonathan Pepin Gagne for those). As for the little characters, the first version has been done by Sabrina Denault (texturing + shading), our main texture artist at SHED. I then modified some aspects of the shading during the production of the shots. Substance Designer was also used to create the flakes on their body. It was a great challenge to develop an interesting lighting for a mouth world. I first received some concepts and color key from Nicolas Cloutier and Fernando Peque. For the final look we went toward something a bit more soft and brighter to give a clean and light feeling. We used Maya with Redshift for our scene assembly. Since March 2017 we now use the Filmic OCIO configuration for our renders. 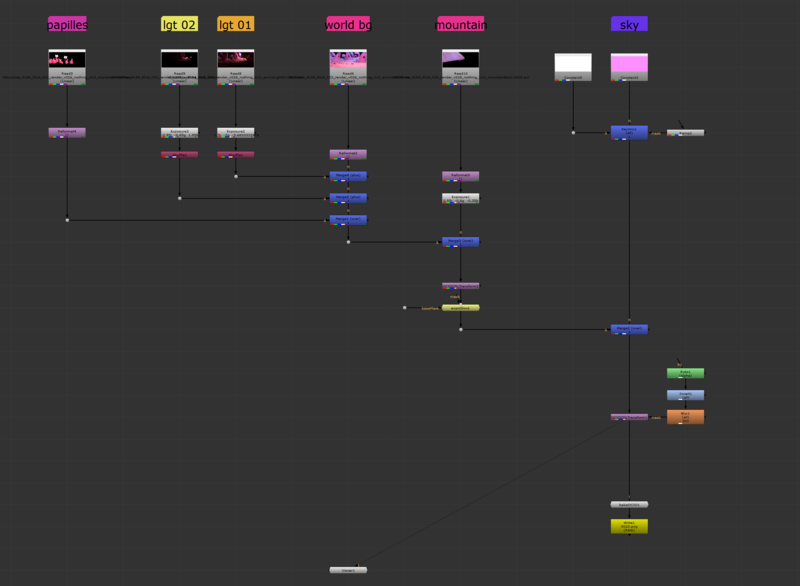 I spent some time to make it work with Maya and NUKE and establish a proper workflow for our pipeline. We now use it for all of our projects. We always use NUKE for this final pass. This time it was pretty straightforward as Filmic is giving us an incredible result just from our scene linear renders. Here is a little screenshot of the comp organization.